During our stay in the Coningsby area, we decided to book a hotel to spend the night in Lincolnshire. Why would we talk about this hotel? What has it to do with aviation? Our choice of the hotel was made by chance through the internet with focus on availability, comfort, looks and quality/price ratio... Quite normal you'll say. As soon as we arrived at the parking lot of Petwood Hotel, we noticed the very nice British look with a Royal Air Force flag floating over the rooftop. In the parking lot a memorial also attracted our attention. 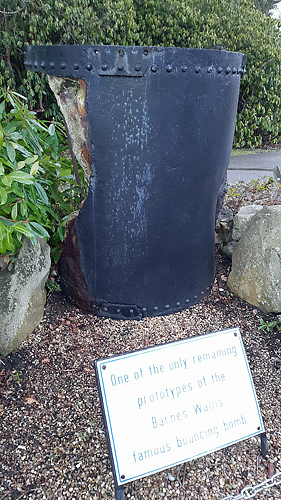 It was a part of a training bomb, bomb designed by Barnes Wallis such as those used during the attack on the Ruhr Dam on the night of May 17, 1943 (Operation Chatise). 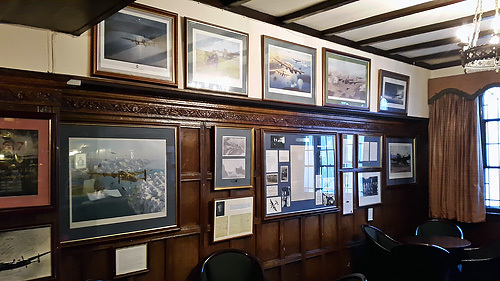 After check-in at the reception desk, we walked up to our room and our attention was much attracted by the many frames on the various walls containing paintings, signed pictures and other items regarding aviation. 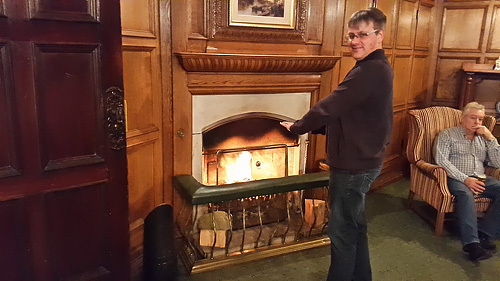 Woodhall Spa Petwood Hotel... here is the story of this mythical place. 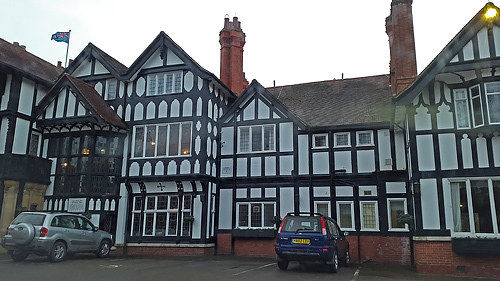 The story of the hotel and Woodhall Spa itself begins in accidental circumstances in 1811, with the arrival of wealthy developer John Parkinson. Spending thousands of pounds, he dug over a kilometer into the ground aiming to establish a coal mine. But his plans were scuppered as the waters of the village spring rose and the works were abandoned. However, Parkinson’s loss was the village’s gain a little over twenty years later as Lord of the Manor Thomas Hotchkin realised the value of the mineral rich spring water below and spent a small fortune of his own building spa baths and accommodation. Visitors flocked to the healing waters and the pretty village at the foot of the Lincolnshire Wolds welcomed trainloads of new guests. Also drawn to Woodhall Spa was wealthy heiress Baroness Grace van Eckhardstein. Undergoing a painful divorce, she hankered for a country retreat and it seemed her favourite wood (or “pet wood” as she called it) was the perfect spot. The bungalow first proposed in 1905 did not meet her lavish tastes however and the project quickly grew wings under impulse of the architect Frank Peck. 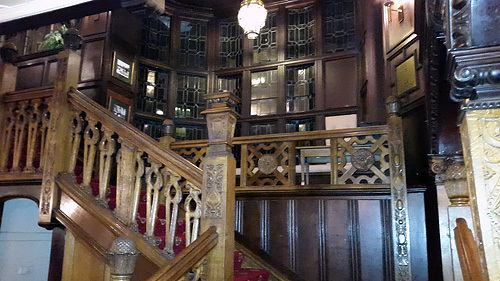 The extended house became a grand affair of “Tudor to Jacobean” style, complete with “elaborate oak features” such as the beautiful hand-carved staircase the visitors still admire to this day. Grace married again in 1910, the house providing an ideal place for her new husband, politician Sir Archibald Weigall, to flaunt his wealth to the great, the good and the not so good. From aristocrats and MPs to music hall stars and sporting greats, all were entertained in style at Petwood. Accustomed to welcoming guests, Grace had the house reopened as a hotel in 1933. 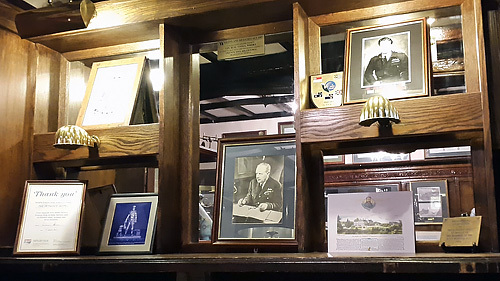 A long list of famous people have stayed at the Petwood over the years. Perhaps the most famous royal stay was King George VI, who not only visited but played tennis on the grounds. It is often forgotten that the king was an excellent player and even competed at Wimbledon. Foreign royalty also visited the premises, including Victoria Eugenie, Queen of Spain. Of the current generation of the British Monarchy, Prince Charles has been a guest at the Petwood. Other dignitaries and aristocrats make up a long list, from Stanley Bruce, Prime Minister of Australia, to Lady Mountbatten. Perhaps no guest made a more spectacular entrance than the Marquis of Douglas and Clydesdale, famous for flying over Everest, who landed his aircraft in the grounds. The high and mighty were not simply present to show off or drink cocktails however; charity parties were popular and such events raised money for good causes such as the local hospital. 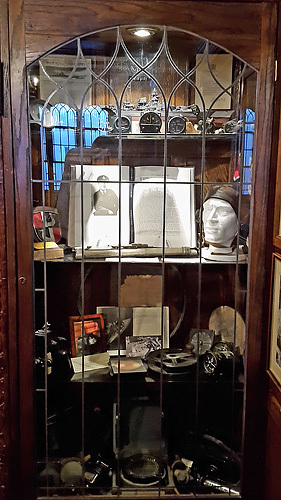 Explorers, sporting greats and stars of the stage and screen also attended regularly. Actress and partygirl Ruby Miller, known to sometimes quaff champagne from one of her slippers, was joined by greats such as Gracie Fields and Australian soprano Dame Nellie Melba. Later guests include Harry Secombe, Edward Woodward and Christopher Plummer. 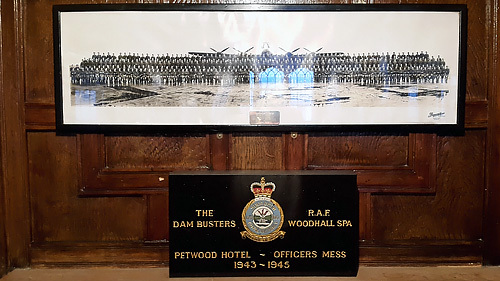 The hotel building served as a military hospital for injured soldiers during the Great War, but it is as the home of the legendary RAF 617 “Dambusters” Squadron in World War II that Petwood is best known. 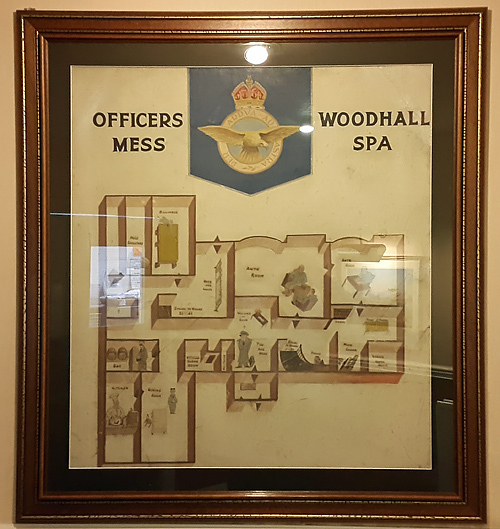 Occupied from 1942, it was originally home to the officers of the 97 and 619 squadrons, but with nearby Woodhall Airfield chosen as the operational base, 619 squadron moved away and the officers of 617 moved in. 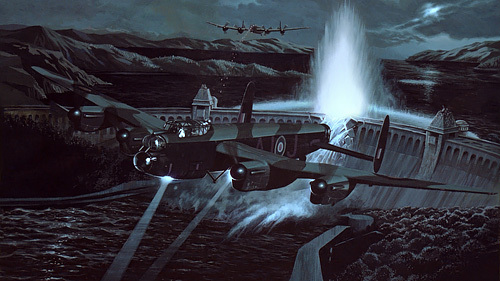 Composed of Canadian, New Zealand and Australian as well as British Air Force personnel, 617 Squadron was a top secret group entrusted with the task of crippling three key German Dams. 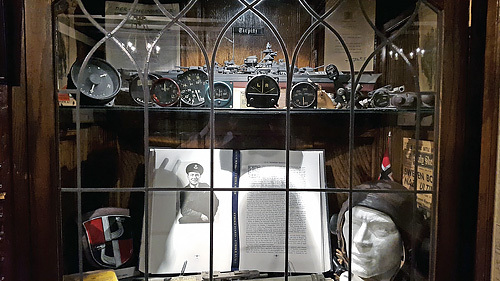 Carried out on May 17th 1943, this crucial attack was called “Operation Chastise” and used an ingenious “Bouncing Bomb” designed by engineer Barnes Wallis. The bouncing explosive was a stroke of genius, able to be launched directly at targets before it detonated underwater, creating a “bubble pulse” effect causing huge damages to enemy targets. 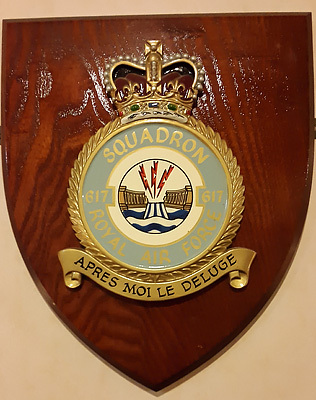 The Squadrons badge, picturing a breached wall, and motto “Après moi, le deluge” (“After me, the flood”) tends homage to the deadly effectiveness of the mission. 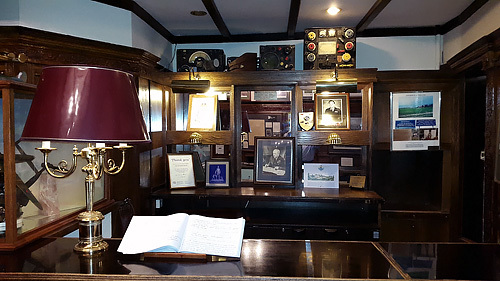 Today, the Squadron Bar hosts a range of memorabilia and tributes to Guy Gibson VC, Leonard Cheshire VC and their officers. 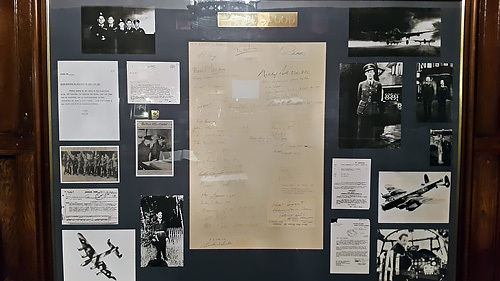 Petwood was the scene of some jubilant celebrations with the breakthroughs made by Squadron 617, as well as their tragic losses. We can only imagine the sheer bravery of the Squadron and the huge risks they took in enemy territory, facing death over and over and again. 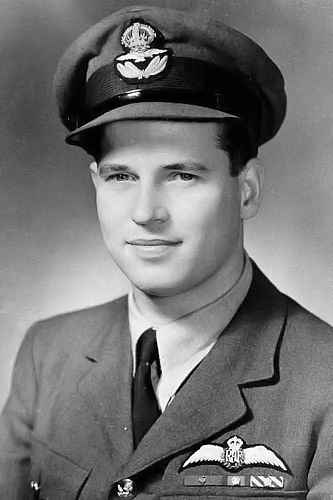 Guy Gibson alone, the Squadron’s heroic young Wing Commander, had carried out over 170 raids by the age of 24. Just two years later he was killed in action. 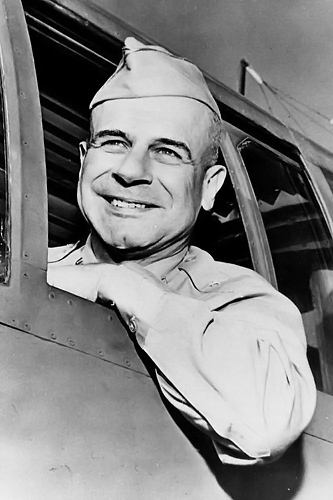 During the war period, the hotel was also the guest to another great man of aviation history: Jimmy Doolittle, the leader of the Tokyo raid. 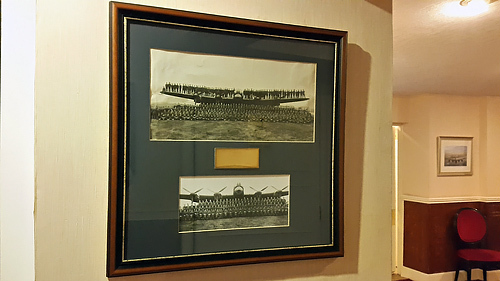 The Squadron’s feats live on at the Petwood Hotel, which remains a fascinating tribute to the Dambusters. 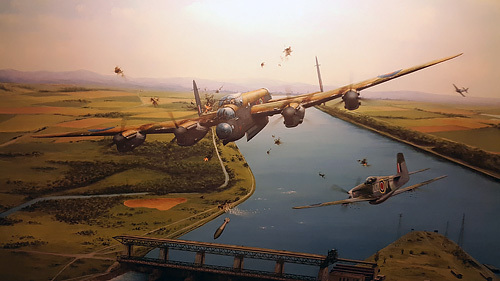 Besides the attacks that destroyed two key dams in the Ruhr area of Germany, the Squadron also used cutting edge “Earthquake” bombs to score critical hits on the warship Tirpitz, and various other key targets including bridges, shelters and channels. In 2010 it was also uncovered that they were being considered for a special mission to target Mussolini himself. 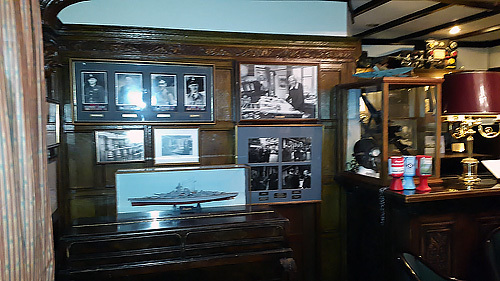 The officer bar with thousand of souvenirs Sinking the "Tirpitz"
Royal Air Force station Woodhall Spa or more simply RAF Woodhall Spa is a former Royal Air Force station located 2 miles (3.2 km) north of Coningsby and 16 miles (26 km) south east of Lincoln, Lincolnshire. Constructed on farmland 1.2 miles (1.9 km) south of Woodhall Spa, the station opened in February 1942 as a satellite station to RAF Coningsby. In August 1943 it became No. 54 Base Substation. 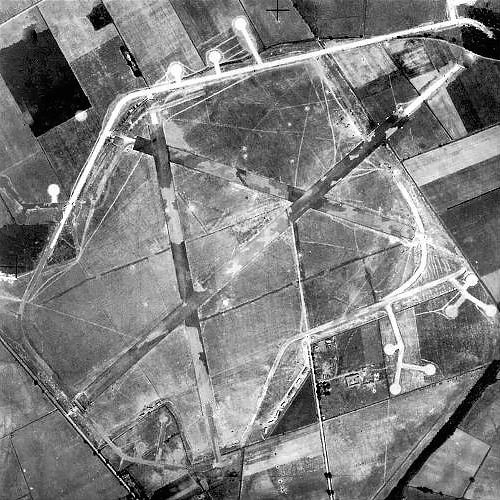 After the victory in Europe the airfield was used as an assembly and kitting out point for the Tiger Force (a proposed heavy bomber force for the far east). After the end of the Second World War and with the move of No. 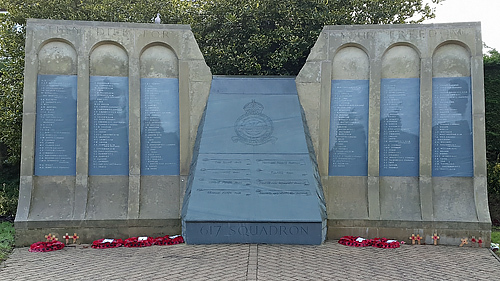 617 Squadron RAF to RAF Waddington, the airfield was closed and the site used by No. 92 Maintenance Unit for the storage of bombs. From the late 1950's it was used as a base for Bristol Bloodhound Missiles until 1964 when most of the site was sold off for agricultural or mineral extraction. 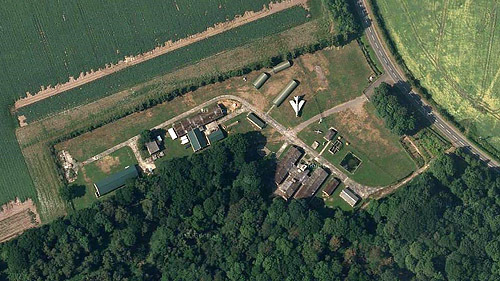 The former missile site used to be under the control of RAF Coningsby having been used for the servicing of McDonnell Douglas Phantom and Panavia Tornado aircraft engines until finally being mothballed in 2003. 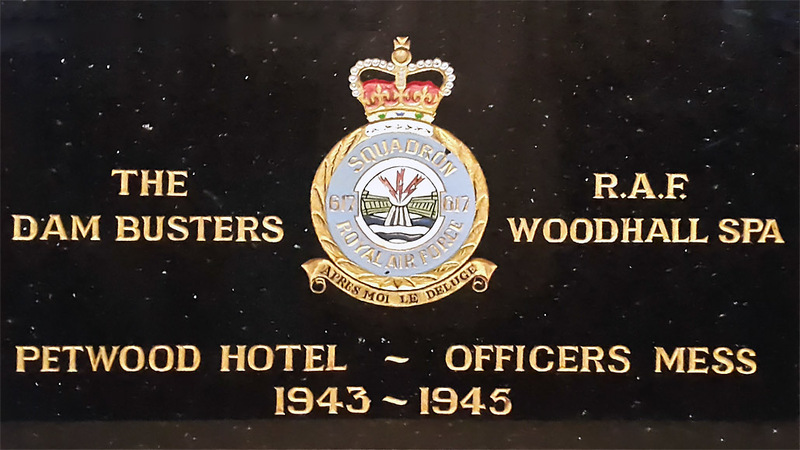 97 Squadron transferred to Woodhall Spa on March 1, 1942. 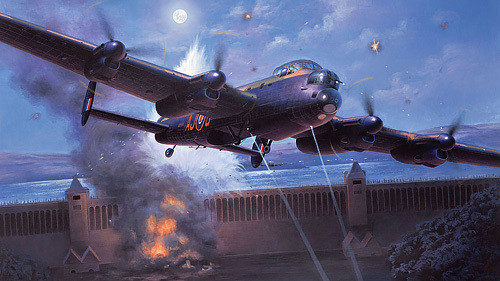 As one of the earliest squadrons to be equipped with Avro Lancasters they were heavily involved with the early operations with this aircraft, including the low level mission to bomb the MAN diesel engine factory in Augsburg on April 17, 1942. 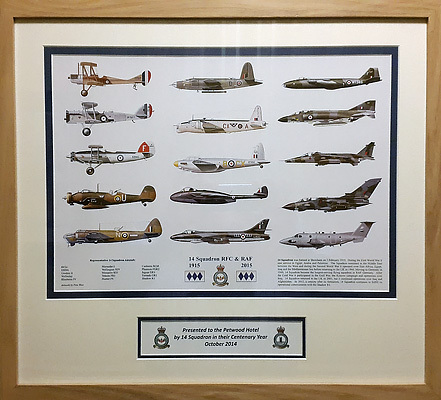 New Zealander Les Munro (as of 2013 the last surviving pilot who flew on 617 Squadron's Dambuster raid), served with 97 Squadron at Woodhall Spa before being posted to Scampton to join 617 in early 1943. He came back to Woodhall Spa in January 1944 when 617 moved there till the end of the war. 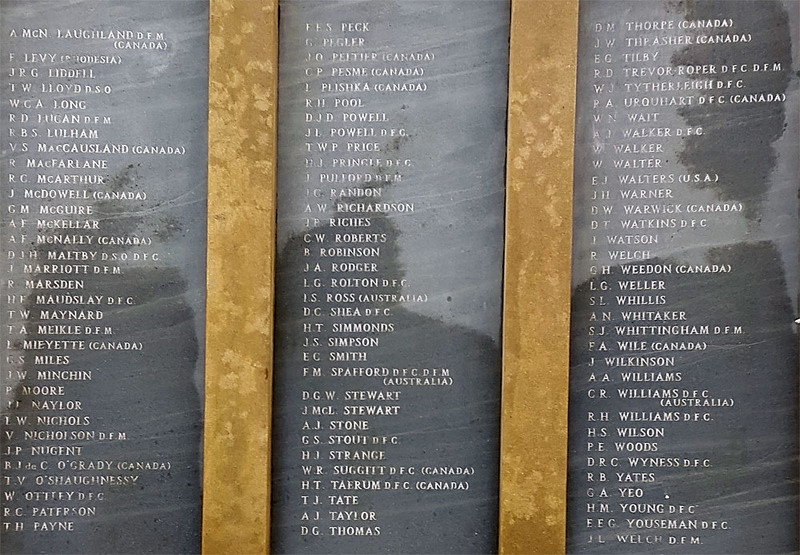 97 Squadron moved to RAF Bourn in 1943 leaving 3 crews behind. 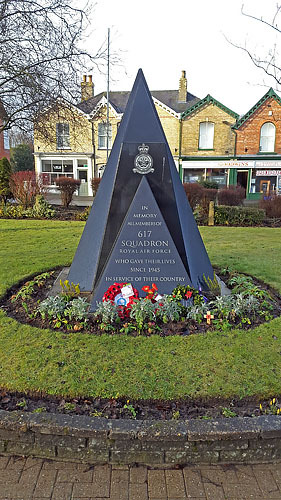 619 Squadron was formed here on April 18, 1943 and moved to RAF Coningsby on January 1, 1944. 617 Squadron came in with 34 Avro Lancasters and 2 De Havilland Mosquito's, the latter being used for low level target designation. 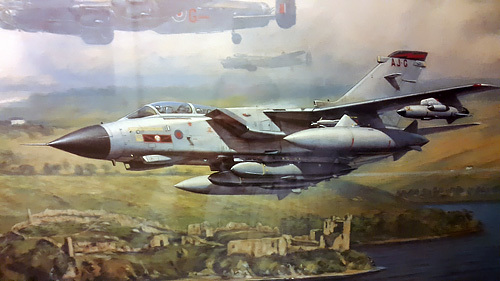 617 Squadron remained here until the end of the hostilities and pioneered the use of the Tallboy and Grand Slam bombs. 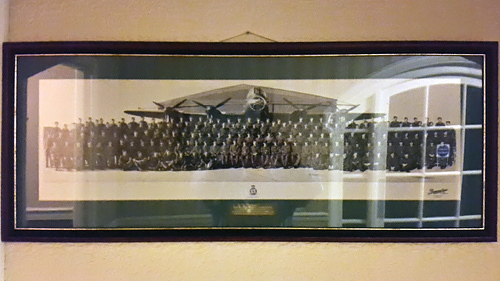 627 Squadron. 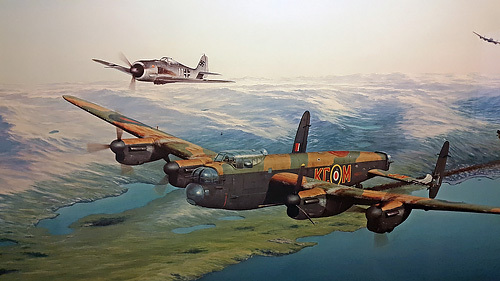 The low level target designation developed by 617 Squadron was so successful that 627 Squadron, a Mosquito unit in No. 8 (PFF) Group, was devoted to 5 Group to operate in this role. 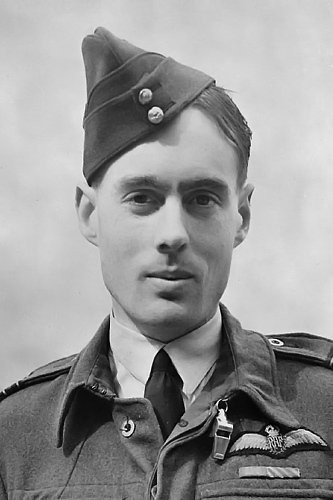 The squadron arrived at Woodhall Spa on April 14, 1944 and stayed until the end of the war. - Dropped the first operational 12,000 lb Tallboy bombs blocking the Saumur railway tunnel, a key point through which passed the direct rail lines from the south of France to Normandy and the active warfront. - Attacked coastal targets, such as the U-boat bases at La Pallice and Lorient also destroying the E-boat pens at Le Havre. - A raid on Brest with the sinking of the cruiser Gueydon. Other attacks directed on Swinemünde culminated in the sinking of the heavy German cruiser Lützow (albeit in shallow water) with a single Tallboy bomb. - The Tirpitz was sunk in Tromsø fjord on November 12 by aircraft from Woodhall Spa and Bardney as part of Operation Catechism. - The last raid from Woodhall was an attack on Hitler's Berghof near Berchtesgaden. 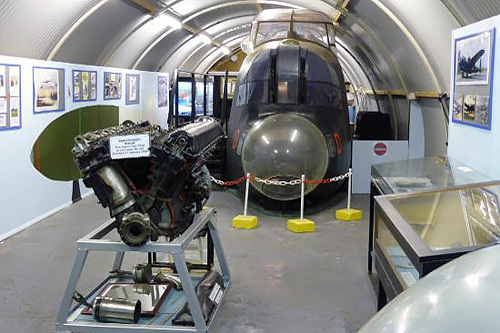 In 1960 RAF Woodhall Spa became a base for the Bristol Bloodhound surface-to-air missiles operated by 222 Squadron. 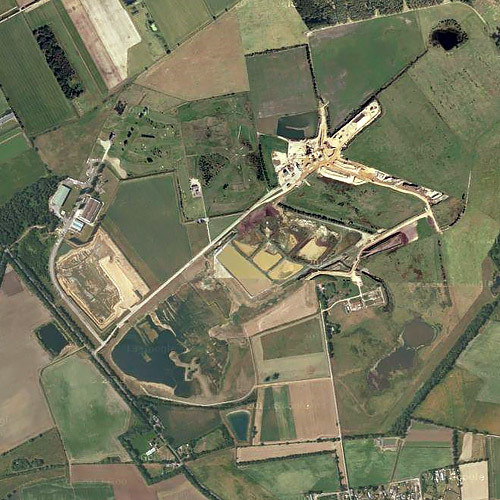 The RAF did continue to occupy a small site on the north western edge of the airfield which they used as an engine maintenance and testing facility; this was known as RAF Woodhall and operated as a satellite unit of nearby RAF Coningsby. 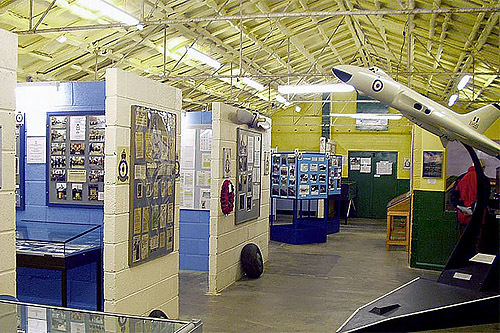 Whilst little evidence remains of the extent of the activities at RAF Woodhall Spa, part of one of the accommodation blocks is now occupied by the Thorpe Camp Visitor Centre and commemorates the sacrifice made by those who fought in the Second World War and has an array of exhibits that portray both RAF Woodhall Spa and many aspects of life both within the forces and civilian life during that period. The Lincolnshire Wildlife Trust owns half the site and have launched an appeal to purchase the remainder to form a wildlife reserve continuous with the reserve at Kirkby Moor. Thorpe Park housed RAF barracks 2.5 miles (4.0 km) south-east from RAF Woodhall Spa on the B1192 road and in the civil parish of Tattershall Thorpe. 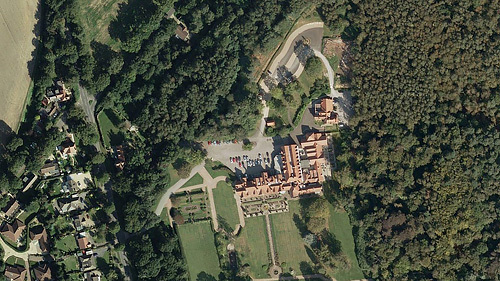 The centre was formerly part of No.1 Communal Site, RAF Woodhall Spa, and was Built in 1940 with a planned life span of only 10 years. 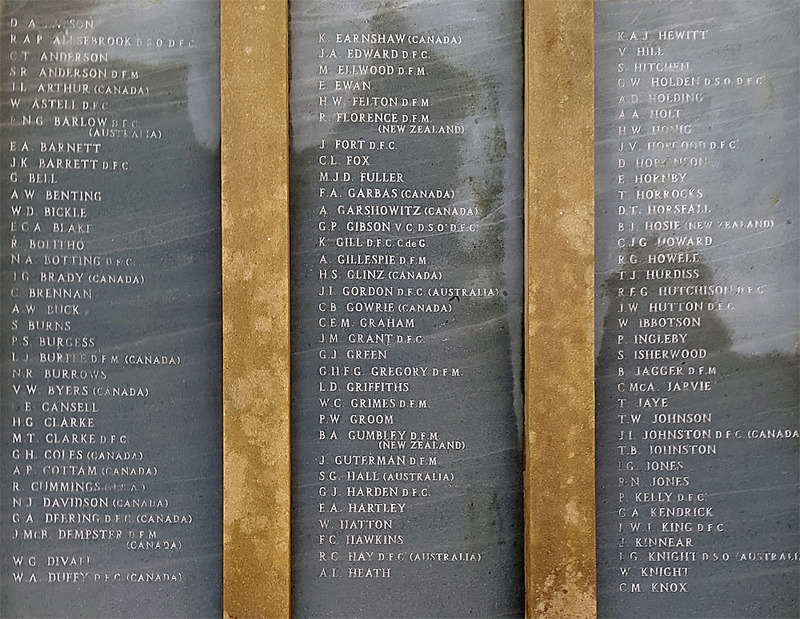 The site included the Officers and Sergeants Messes, Airmen's Dining Halls and the NAAFI building, together with ration stores, latrines and ablution block. Only the Airmens's Dining Halls, the NAAFI, Ablution Block and Ration Store are within the Centre's boundary. The site closed in the 1960's. 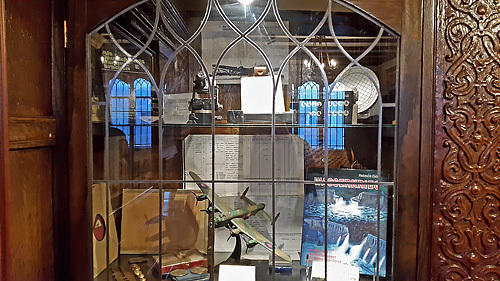 The Thorpe Camp Preservation Group established the Visitor Centre in 1988 to commemorate those Airmen who flew from this airfield during World War II.